West Belfast twins Amy and Liam Murray have a starring role in a radio advert for Cancer Focus Northern Ireland in memory of their dad, Liam, who passed away on New Year’s Day 2010 when the twins were three years old. Dad Liam had diagnosed with a terminal brain tumour only months earlier when he was just 31. Amy and Liam (9) volunteered to help Cancer Focus NI’s Spirit of Christmas Appeal on Q radio. The money raised by the appeal will go to the charity’s family support service, which helps children who are spending Christmas without a mum or dad this year because of cancer. The twins use the family support service and want to help fund the service so that other children in a similar situation can also benefit. The advert will run from Saturday, December 3, until Saturday, December 17, on Q Radio. Bernie Murray (38), said: “When we were told the cancer was terminal in September 2009 we were put in touch with Rachel Smith, the family support coordinator at Cancer Focus NI. “Liam had been diagnosed with a brain tumour when he was 19 but was able to live a normal life for years. He had his first surgery when he was 24, over the years had two surgeries, radiotherapy and chemotherapy. But it was only when he was 31 that the cancer became aggressive,” she said. Bernie remembers that her husband always had a very positive attitude around the children and the couple were very honest with them about what was happening. Watch this video to hear more about the #SpiritofChristmas Appeal. “Rachel at Cancer Focus NI helped us prepare what we were going to tell the kids. She helped their dad put together messages that they will be able to read when they are older along with mementos for them to keep. “Rachel advised us about what stories we could read to them to help them understand, to prepare them for what was coming. The twins also joined the Cancer Focus NI family support group. “They were able to meet other children in the same situation and it helped them realise they were not the only ones going through such a sad time. “They have so much fun at the group and can forget for a while – they learn that it is still all right to have fun,” Bernie explained. “I was able to talk to other parents who’d lost a partner and I got bereavement counselling with Cancer Focus NI which really helps too. I wasn’t talking to anyone at home so having someone outside the family helped me to open up and express all that emotion. It was so helpful. 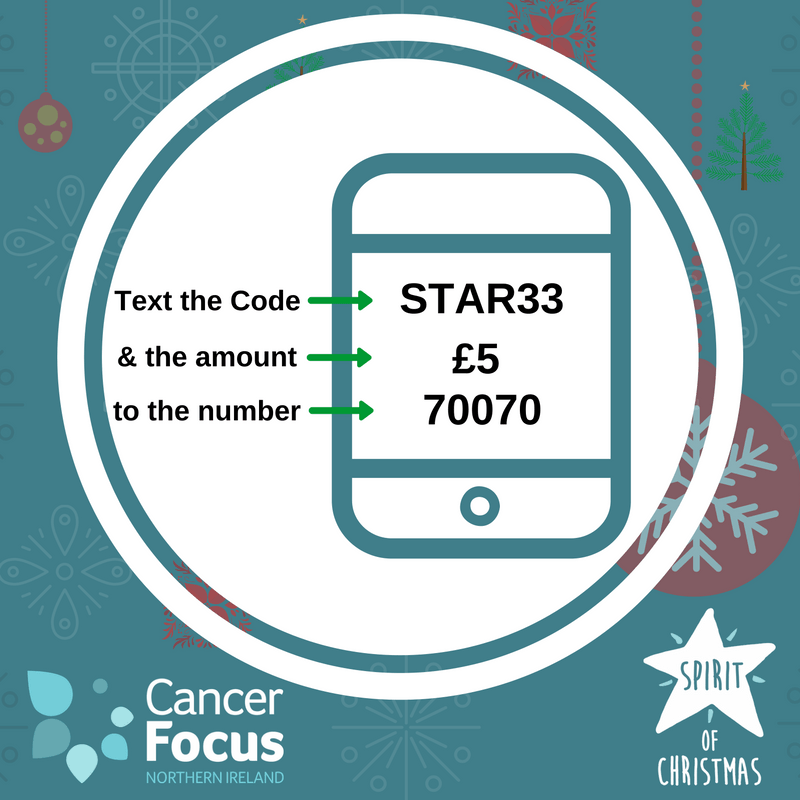 If you would like to make a gift to the Cancer Focus NI Spirit of Christmas Appeal just Text ‘STAR33 £5’ to 70070 or call Cancer Focus NI on 028 9066 3281.